During the fall and winter, sweet potatoes are my favorite vegetables to spiralize. This starchy, sweet-tasting root veggie adds so much flavor and color to any dish, it’s a great base for a noodle bowl. Today, I’ve made a very simple dish: quinoa, roasted onions, sweet potato noodles and a tahini-maple dressing. If you’ve ever fallen victim to the following dinner, you’re not alone: roasted chicken, cubed roasted sweet potatoes and steamed broccoli. Simply, if you’ve ever made a dinner with sweet potatoes that are diced, cubed, or thinly sliced into rounds, you’re not alone. But now, time’s are a-ch-ch-changing and we’re going to set the knife down and bring on the spiralizer. 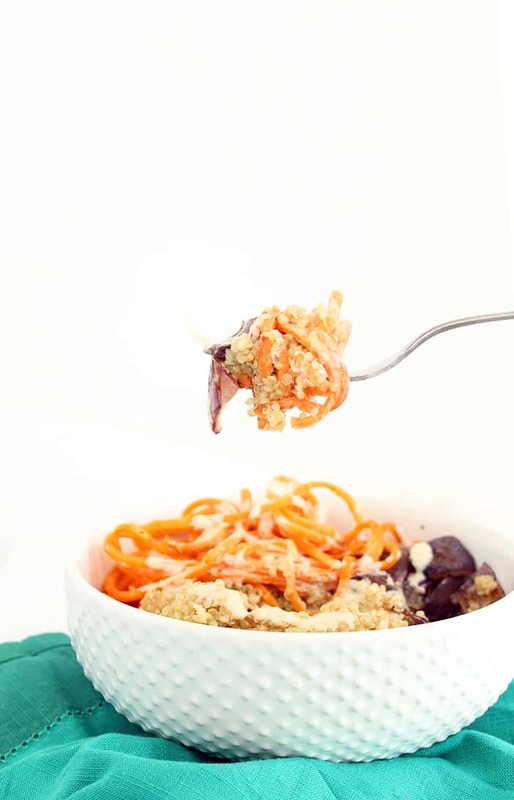 By spiralizing the sweet potatoes and transforming them into noodles, you suddenly have a totally different meal. The best part about eating noodles is that you can throw anything on top, pour over a healthy dressing or sauce, mix everything altogether and each bite is much more powerful than that dreaded protein-veggie-starch divided plate. Whenever I don’t have something on-hand to spiralize (which is very very rare), I’ll make salmon, sweet potatoes and brussels sprouts. It’s almost painstakingly difficult to eat those cubed sweet potatoes, because I know how much more enjoyable the meal would be if I was eating a big fluffy bowl of noodles. Noodles last longer (you just get more noodles than cubes), they’re more enjoyable to eat, and who doesn’t love a Chipotle-style meal? If you’ve never been to Chipotle, it’s just like a salad bar for Mexican food, so you pick your base and start loading up on toppings. See how quickly you can build upon this basic noodle bowl? It’s that easy! 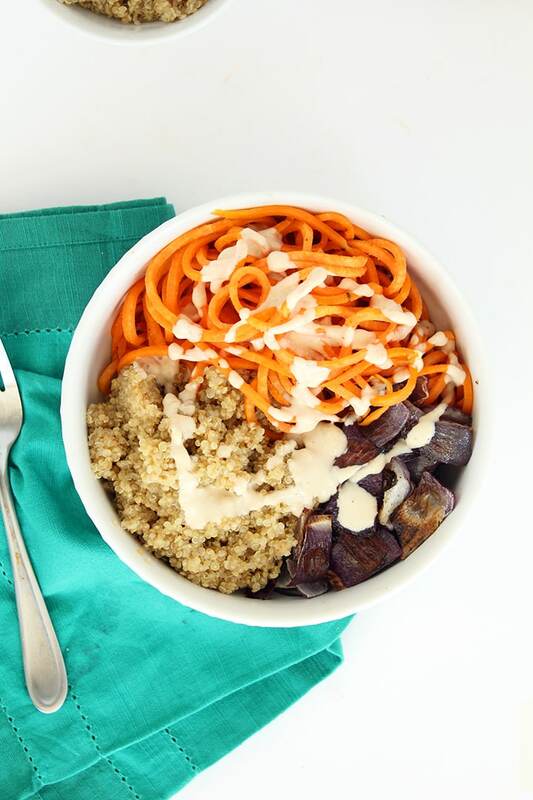 Take today’s simple recipe as inspiration for your own sweet potato noodle bowl and hashtag #inspiralized next time on Instagram so I can see your creation! 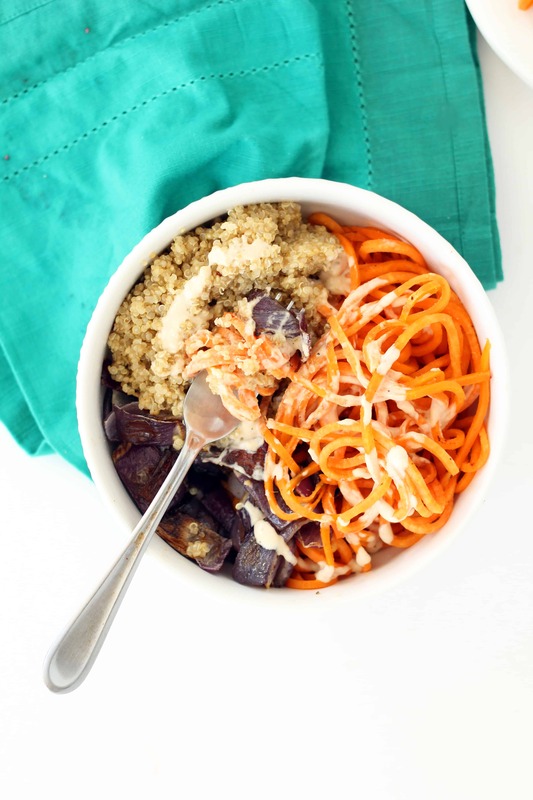 What toppings would you add to this sweet potato noodle bowl? Preheat the oven to 425 degrees. Place the onions a nonstick baking tray and drizzle with ½ tablespoon of the olive oil. Toss with hands to fully coat and season with salt and pepper. Roast for 20-25 minutes, tossing once. While the onions are roasting, place the quinoa in a small saucepan with the water, cover, bring to a boil and then uncover and lower heat and let simmer for 15-20 minutes or until quinoa is fluffy. 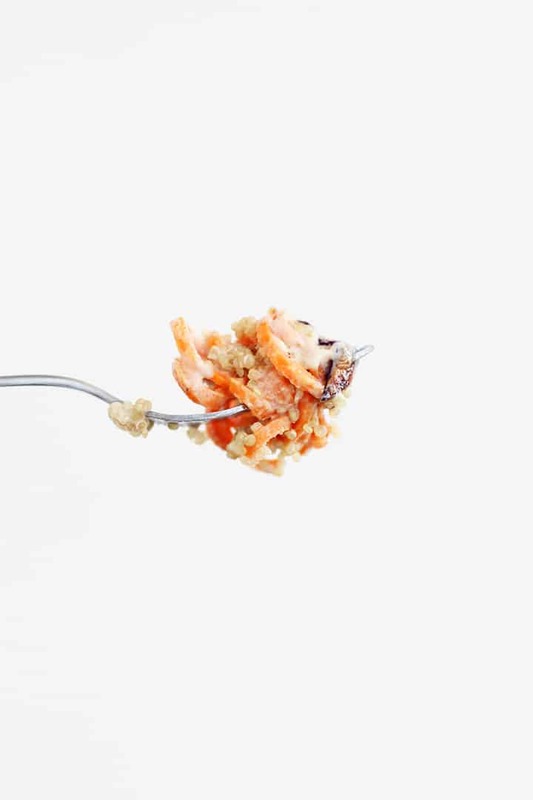 Once you place quinoa on the stovetop, place a large skillet over medium heat and add in the rest of the olive oil. Once oil heats, add in the sweet potato noodles and season with salt, pepper and garlic powder. Cover and cook for 5-7 minutes, uncovering to toss occasionally, until sweet potatoes are cooked through. While the sweet potatoes are cooking, combine all of the ingredients for the dressing into a bowl and whisk until combined. Add more water if needed to thin the dressing out to your preference. 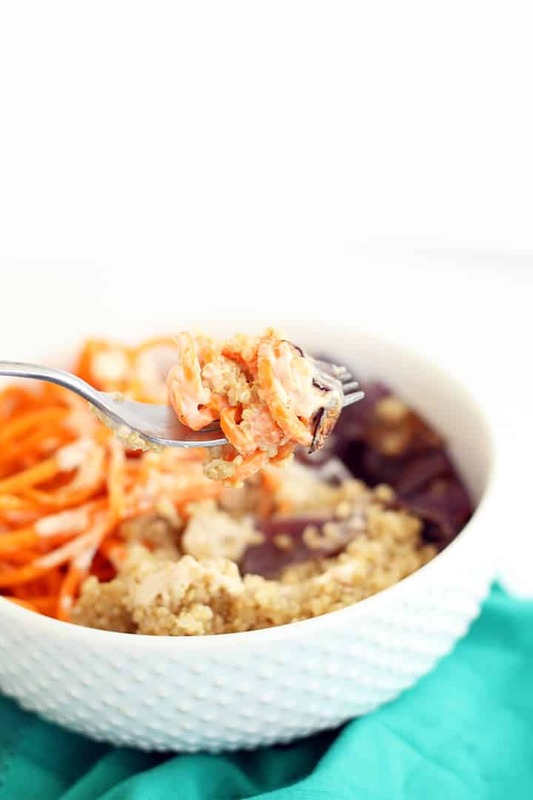 Once onions, sweet potatoes and quinoa are done cooking, combine the quinoa, sweet potatoes and onions in a bowl and top with a drizzle of the dressing. The flavour combination here is amazing! Though I don't own an Inspiralizer (yet), I will duplicate this with grated sweet potatoes. Thanks for the inspiration! Yum! I think I will add some marinated tempeh to this. Thanks! What do I think?! I think I need to make this NOW! YUMMMM! Thank you! I purchased a spiral slicer today, found your web site and can't wait to get started. Made this for dinner tonight. My spiralizer came in mail today (yes, Sunday, thank you Amazon) and I was looking for a recipe to try it out. Just happened to have all the ingredients listed here (used leftover quinoa with mixed vegetables I had made for dinner a couple of nights ago). This was AMAZING!. Delicious! Love the texture and flavor combinations. Totally unexpected. Thank you. I'm so happy to hear that! Thank you for trying it out! I love you for sharing this recipe. The first time I made it as posted and it was outstanding. Since then I have been playing around with different ingredients, and everything has been a hit. Try it with flank steak along with the sweet potato noodles and roasted onions, drizzled with a garlic cream sauce. Tonight I am using BBQ shredded chicken for the protein along with my, "noodles" and onions, and a bleu cheese sauce on top. Fantastic recipe and base. Ali - do you think this would work ok if you subbed honey for maple syrup? I know it won't be the same dressing technically but the honey might make it just as sweet? love your recipes!! That would work just as well, Andreya! I made this tonight for dinner and it's a winner. I had no red onion so I used yellow, which wasn't as pretty but tasted great. I wished I had more dressing but I think it was because I had a humongous sweet potato. I topped it with well-seasoned sautéed salmon filets which went beautifully with the flavors. The salmon seasoning I used had a lot of fennel, and the combo of the fennel and salmon with this mixture was divine. I would like something green in it, maybe a couple handfuls of baby spinach, or roast some Brussell's sprouts with the onion. It doesn't need any additional flavor but it would be really pretty.